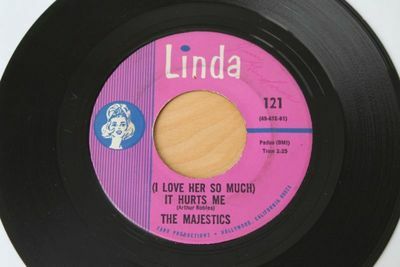 Here is the 45 “(I Love Her So Much) It Hurts Me" b/w “Girl Of My Dreams" by The Majestics, Linda 121, 1965. Original first press. More Soul listed, check them out! Save on shipping! Vinyl is VG - Some light scratches and scuffs (nothing deep enough to feel with a fingertip). Plays great with mild surface noise, hear below. Labels look VG, minor dark wear, red pen on A side, black marker on B side. M – Mint – Unopened or just opened. I very rarely use this grade, I reserve it for the most pristine copies. NM (+&-) – Near Mint – Record has been treated with care. Free of notable scratches or abrasions. Label is generally in great condition. VG++ (or EX) – Very Good ++ - May have a couple light surface scratches or scuffs, but is very listenable and should not disturb play. Label may have slight wear, writing or marks. VG (+&-) – Very Good – May have more than a few light scratches or a couple heavier scratches or scuffs. May play with some crackling, but not enough to overpower the music. Sleeve may have a seam split, ring wear, writing, etc. G (+&-)– Good – Record may have multiple scratches or small gouge(s). May have significant crackling that may overpower the music, but still listenable. Label may be torn. F (+&-) – Fair – Record has significant damage. Within the continental U.S. is a flat rate of $4.00 via USPS first class, or Media Mail for albums. 45's & 7" Records - Up to 5 can be sent for $4.00 within the U.S. $1.00 per additional LP within the U.S. Shipping within North America (Canada and Mexico) is $12 via USPS first class for 45s or Media Mail for LPs. 45's & 7" Records - Up to 5 can be sent for $12. $3.00 per additional LP. International shipping is a flat rate of $15 for 45’s and $18 for albums via USPS first class. 45's & 7" Records - Up to 5 can be sent for $15 internationally. $3.00 per additional LP internationally (up to 5, double LP's count as 2). More than 5 LP's will be shipped in multiple boxes via First Class or one box via Priority. I use only high-quality shipping materials designed for mailing records. If your purchase is over $50, I encourage insurance. Payment must be received within 3 days of purchase to assure 1 day handling time, but I will accept payment after 5 days. If your payment is going to be later than this, please let me know. I do accept returns for a full refund if the record is broken, not the one you purchased, or grossly misrepresented. If you are unsatisfied with your order, PLEASE contact me before mailing the record back or leaving negative feedback. I cannot be responsible, however, for items lost in transit or in customs, so please be aware of the customs processes’ in your country and consider insurance if this is a concern.